Find an address in one of the three ways detailed previously. The pin with the flag indicates the sought-after address. Tap the Quick Driving Directions button on the left end of the pin’s flag. Tap the right end of the flag and go to Step 3. Tap the Directions button to the left of the Search field in the upper left corner and go to Step 4. A quick way to get directions from your current location is to search for the address you want to go to and when the map is pinned, tap the Driving directions button on the left end of the flag. A route is immediately calculated; skip ahead to Step 6. Directions to Here: The Directions screen opens. Current Location is the default for the starting point. Directions from Here: The Directions screen opens; however, Current Location is the default ending point or destination. To use an address different than your Current Location as a starting or ending point, tap in the field that contains Current Location. Tap the circled X on the right end of the field to clear the field. Type in the address you wish to use. Tap the Next button on the bottom right. The cursor moves to the other field, which has the previously established address. You can change it with the keyboard if you want. Swap the Start and End points of the Directions by taping the Swap button. If you want directions and travel time for walking between destinations, tap the pedestrian button at the top of the screen. Tap the bus button, or the Transit Directions button on the Location screen, to open the App Store and see a list of apps associated with the public transportation available for the area of your chosen directions, which you can download and use to search for a public transportation solution. 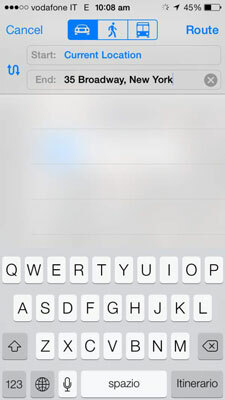 Tap the Route button in the upper right corner or on the lower right corner of the keyboard. The screen displays a map showing the route from your starting point to your destination, or from your destination back to your starting point, if you prefer. The distance and estimated travel time are displayed above the map. 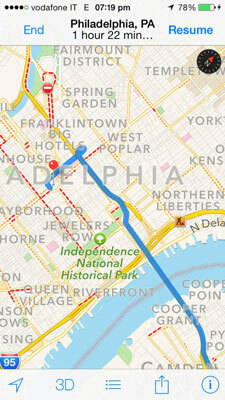 If more than one route is available, Maps displays alternate routes, assigning a number to each. Tap the route you want to follow. Tap the Info button to select and change how you see the map. Standard shows you a map. This is the default view. Hybrid shows the street names on a satellite view. 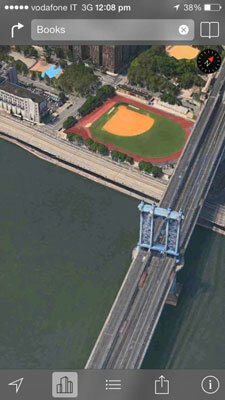 Satellite shows a satellite view. If you ever wanted to take flight like a bird and swoop among the tall buildings of some of the world’s most famous cities, tap the 3D or Flyover button next to the Tracking button to see the your standard view map in 3D or a hybrid or satellite view in Flyover mode (requires iPhone 4s or later). Zoom in until the 3D or Flyover button is active. The 3D or Flyover button is gray if the services are unavailable. This feature is only available in some locations. Red dashes shows where traffic is heavy and stop and go. Orange dots means traffic is moving slowly. Road Closed icons mean what they show — road closed. Men At Work icons indicate road work. Tap the Start button in the upper right corner. If you have an iPhone 4s or later and an active Internet connection, point-to-point directions are dictated to you as you move along the route. 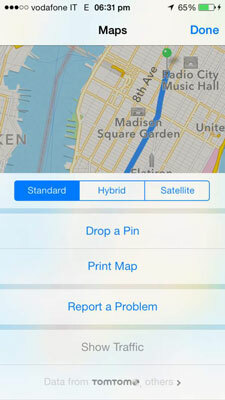 In Map, Satellite, or Hybrid view, Maps zooms in to the first step of the list. Swipe across the indicators at the top of the screen to move from one step to the next. Tap the Overview button to see the indications from starting point to destination on the map. Tap the List button (next to the Tracking button in Overview) to see a list of the point-to-point directions. Tap any item in the list to see that point on the map. Tap Overview, and then tap Resume to return to the point-to-point instructions. If you want to change your starting point or destination or the whole route, tap the End button in the upper left corner and start over. When you’re looking for directions during the dark hours of the day, Maps automatically switches to Night mode, which shows light text on a dark background.